The landscape of late-night television has played out a bit like a game of musical chairs over the past year. While an onslaught of retirements were lamented by many a longtime fan, those announced to covet the seats (and desks, as it were) of comedy aficionados like Jon Stewart and David Letterman has arguably pacified any threat that late-night television will suffer any hiccup in its staple ability to entertain and garner laughs. An article in this month's Vanity Fair even noted how what could have been predicted as a disconcerting amount of change-up in late-night host duties has actually "revitalized the format," but, as its all-male photo showed, it went on to note that any rejuvenation or progression in the fabric has been visibly stymied by the staggering lack of women in late-night television in front of the camera and behind-the-scenes. "How gobsmackingly insane is it that no TV network has had the common sense—and that’s all we’re talking about in 2015, not courage, bravery, or even decency—to hand over the reins of an existing late-night comedy program to a female person? While Amy Schumer has acknowledged that she turned down The Daily Show, happy where she is at Comedy Central, that doesn’t mitigate the fact that Chelsea Peretti, Megan Amram, and Jen Kirkman, to name but three contenders, are alive, sentient, funny, and presumably open to taking a meeting." 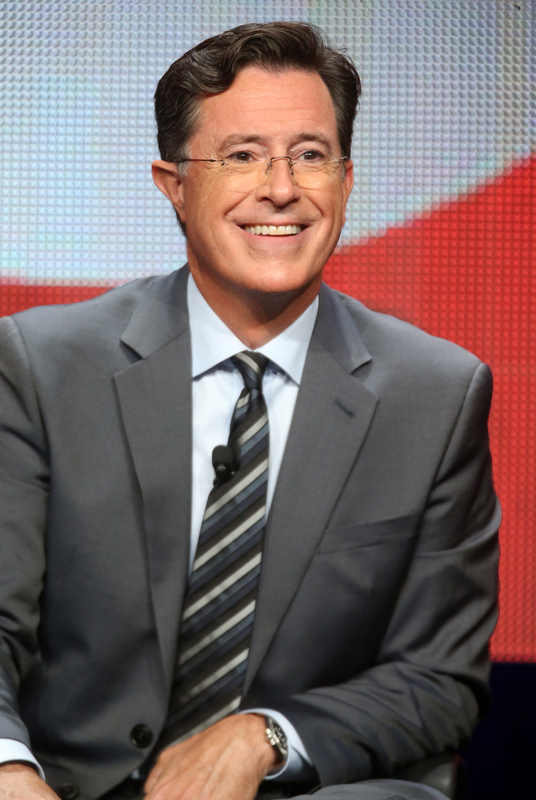 I was one of the many longtime The Colbert Report fans who anxiously counted down the days until the comedian shed his parodied pundit to give us a more authentic glimpse as the new The Late Show host. This elation unfortunately devolved into an audible groan when a Sept. 10 report from Splitsider revealed that, "...just two out of the 19 staff writers are women, and 19 out of the 19 staff writers are white." The archaic — and maddeningly erroneous — stereotype that women can't be funny has been upended time and time (and time, and time, and...you get the point) again. Amy Schumer has been the most recent comedian to be at the forefront in quashing hackneyed ideas with her hilarious — and culturally progressive — series Inside Amy Schumer, while the women of Broad City are also keen on foregoing tropes with their hilarious and self-aware antics. And yet, the ratio of male to female comedy writers continues to be overwhelmingly disproportionate. According to an April 2012 article from The Huffington Post, statistics have shown that the number of female TV writers has actually decreased in recent years. "In the 2006-2007 television season, 35 percent of the writers of broadcast network, prime-time programs were women, according to an annual study by San Diego University's Center for the Study of Women in Television and Film. In the 2010-2011 season, that number had dropped by more than half, to 15 percent." During the 2014 New York Comedy Festival, Jill Goodwin — the only female writer on a staff of 13 for The Late Show with David Letterman — noted the frustrations that come with a lack of diversity in writers' rooms. "I would love to work with more women,” Goodwin said. “I think and I hope that the trend will continue to be towards a more diverse writers room — not because of a quota or order or outcry — but because everyone has discovered that it makes for a more dynamic writers room." Former head writer, Matt Roberts, posited that his experience with hiring more male writers over female had become an issue with applications, as opposed to prejudice. While the exact reasons for a lack of diversity ons-creen and off continues to be a prominent topic of debate, the pernicious effects inclusive work environments clearly demands attention. For late-night television, shifting the genre's reputation as a literal boys' club could definitely be a beneficial change to go along with other recent switch-ups.